Discover the luxury and joys of sailing the wonders of the Aegean Sea and the ancient Greek world of Byzantium, a land of heroes, myth and wonder. This cruise, offered during automn, spring and winter, takes you back into history to some of the most incredible history around the Peloponnese coastline, discovering the glories of this often forgotten part of Greece. On making your way to Marina Zea, you will embark the boat between two and three in the afternoon. You will be met by the crew, given a welcoming drink and taken to your cabins. This is also your first opportunity to meet your fellow passengers. 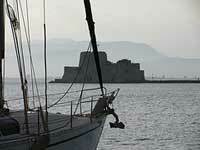 Later in the afternoon the boat sails to Palaia Epidaurus for an early evening arrival. Dinner is held on board and the boat will dock in Palea(=old) Epidaurus for the night. Please speak to us if require a transfer from your Athens hotel or the airport to the marina. Leaving the ship early in the morning, today's excursion takes you to Ancient Epidaurus, known throughout Greece as a centre of healing. It is also home to an incredible amphitheatre, well preserved and still in use today. Your excursion will take you around to ruins of Epidaurus, where your English speaking guide will explain more of the history of the place. After this, you will visit the amphitheatre, with its near perfect acoustics, it is known for its symmetry and beauty. After this, you will be returned to the ship and lunch will be provided on board. The cruiser then sets sail for the magical town of Napflion, where the boat will moor overnight. This evening you can have a wander around this beautiful seaside town, taking in the small fortress that lies in the harbour. After a short walking tour of Napflion town, you will board a coach for the short drive through the pretty countryside of Argolis for the town of Mycenae. Home to Homer's Agamemnon and Clytamnestra, the centre of all Greek tragedy, the ancient site of Mycenae is one of the better preserved archaeological sites in Greece. 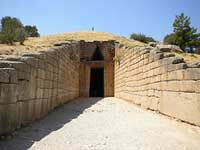 Your tour will take in the Lion's Gate and the Tomb of Agamemnon as well as a visit to the site's museum. After the excursion you will be returned to the ship where lunch will be served. The ship then sails to the charming town of Monemvassia, a charming town in the southern Peloponnese. The boat will sail to the town of Gythion on the evening. The boat will arrive in Gythion as you are waking in your cabins. 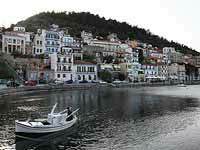 This part of the Peloponnese is known for its outstanding beauty and natural wonders. Today's excursion on the Mani peninsula will take in the Dirou Caves, which were discovered in the 1960s and are one of the most important natural sites of Greece. 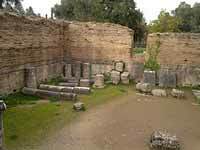 The excursion will also take you to the town of Areopolis for a look through the traditional town. This region of the Peloponnese is unlike no other region in Greece - desolate and windswept with a myriad of natural wonders. Returning to the ship later in the afternoon, the ship will sail to the port of Pylos, further along the Peloponnese coastline. 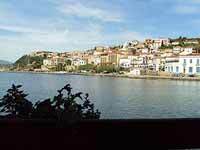 Today's excursion takes you around the area of Pylos, on the Southwest corner of the Peloponnese. This is the sight of one of the most important naval battles in Greek history, the place where the Venetians defeated the Ottomans and made way for the Modern Greek state to come to pass. On today's touring you will be taken around this quaint town and the surrounding hillsides, taking regular stops to witness the remarkable scenery. The main part of the excursion will take in a visit to Nestor's Palace. These prehistoric archaeological remains sit on a hill on the outskirts of Pylos and you will visit the well preserved apartments and courtyard at this site. After visiting this sight you will alight the coach and return to Pylos, where you will visit the superb archaeological museum associated with the ancient site. Boarding the ship late in the afternoon, you will make your way overnight to the port of Katakolon. 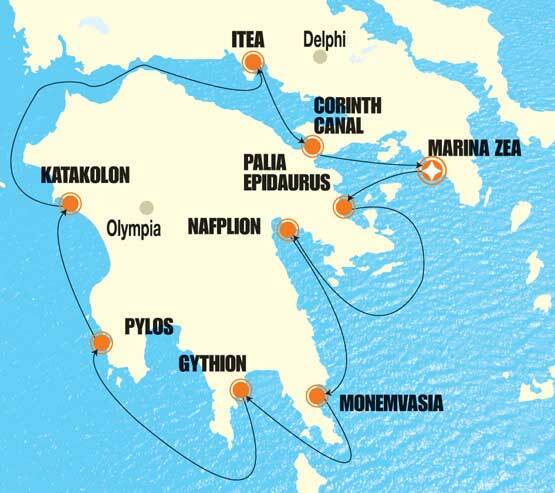 Disembarking early on this sixth morning of the tour, you will travel by bus from the port of Katakolon to Olympia, home of the ancient Olympic Games and the site where the all Modern Olympic Games have their commencement, as this is where the sacred flame begins its journey. You will tour this amazing site, looking over the stadium, which looks very much like how it did two thousand years ago. This site is an incredible morning of history, both modern and ancient. Your English speaking guide will take you around the major areas of this site and the tour concludes at the Olympia Museum with its artefacts dedicated to the history of the Olympic Games. After some leisure time in Olympia, you will board the bus where you will be taken to the city of Patras, on the northeast tip of the Peloponnese where you will meet the ship. On embarking on the boat, you will make your way down the Gulf of Corinth to Itea where the ship will moor for the night. 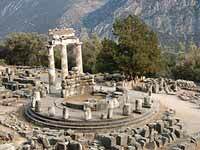 An early start for today's excursion will have you travelling to the most important spiritual site in Greece, the ancient site of Delphi, home of the oracle and one of the most stunning sites found on the Greek mainland. Travelling a short distance through the mountains, you will be shown around this incredible place, nestles a short distance from Mount Parnassos. You will have a half a day to take in the well preserved ruins and the wonderful museum adjoining the site. This is one of the highlights of your tour around Greece. Later in the afternoon you will be taken back to the ship to witness one of the modern marvels of this nation, the Corinth Canal. This canal, built in the 1800s, joins the Adriatic and Aegean Seas. The short crossing through the amazing cliffs of the canal will take you back to the Aegean for the short sailing to Marina Zea. This last night on board will give you a chance to say goodbye and farewell to your fellow passengers. The boat will moor at Marina Zea for the evening. After breakfast you will leave the boat for you onward journey, whether this is to your home, or to another part of Greece. Please speak to us if you wish to arrange transfers, flights or accommodation for your onward travels.